And guess what – it’s time for the next one! Typically I don’t use my blog to spread the word about this, but this time I want to invite bloggers, instagrammers and all of social media to participate (plus have a place to answer lots of questions in an easier forum than a tiny IG comment section). Our theme has been suggested to me from several past participants and I am SO excited for it. Drumroll please …. The next exchange theme is A MUG EXCHANGE! Woooohooooooo! Anyone who is currently trying to get pregnant, including those suffering from secondary infertility; those who have recently adopted, are in the process of adopting or searching for their new family member; anyone who is currently pregnant after dealing with infertility or recently having had a baby after a struggle and lastly, anyone who is using a gestational carrier, egg donor, sperm donor or surrogate. Please note that you may be given anyone to purchase for, not necessarily someone who is on the exact same journey as you. As this exchange grows, it has become increasingly more difficult to ensure that you get an equally appropriate match. Just try to remember that you are encouraging another TTC sister no matter what their story is! Once you sign up and get the name of the person you are sending to (more details below), you will work to put together an exchange box for them, including a coffee/tea cup/mug. You will be given a “send-by” date and I ask that you respect that date unless there are extreme circumstances. You will send a box to someone and receive one from someone else! Typically the suggested amount per box is $20 plus shipping. I don’t advise that you spend more than $20 but we definitely do have some generous women who put together a box worth more. Since not all mugs cost $20, you are able to fill the package with ANYTHING else that might make someone smile! Lucky socks, a special treat, a fun lipgloss or nail polish …. You can’t go wrong (unless you break the law) – this is definitely a situation where it’s the thought that counts. I do ask that you invest in a lot of bubble wrap and a good box. It helps tremendously to ship it US Priority and get a tracking number just in case anything should happen during transit. (Plus it comes with $50 insurance!) No one wants to receive a shattered mug due to poor packaging! Besides a mug, is there anything else I HAVE to include? A note! Please include a card inside with a special word of encouragement for your new friend. Many will include a way for their person to get in touch with them – a twitter handle, blog or email address or IG account – it’s really helpful for me if you include your name so that my inbox isn’t inundated with “who should I thank! ?” emails. Yep! We always have women from all over the world participate and I think that is what makes it so much fun! HOWEVER, you will only be assigned an overseas person if you agree to be open to shipping internationally. (More about that below). I do ask that if you live outside of the US, that you be open to shipping internationally, as many of the participants are located in the United States, however I know that sometimes that’s not an option and that’s okay too. So am I exchanging with the same person I am sending one to? Nope! The fun part is that who you are sending to will be a completely different person than who you receive one from. Does that mean I should keep my person a secret? It certainly does make it fun when that happens but it’s not necessary. If you are too excited to hold it in, feel free to share. You will be getting their social media information so feel free to friend them, follow them or look them up! What kind of mug do I need to send? You can get ANY kind of mug. Travel, big, small, delicate, clunky. It could be a cute mug from your local coffee shop, something you ordered on Etsy, bought at Walmart, or purchased from a garage sale (just make sure it’s clean). There are SO many adorable mugs out there – be creative! Don’t put too much pressure on yourself – this can be a mug that you adore or that you think someone else would love. Because shipping a mug can be tricky, there may be some women who just want to order a mug online and have it shipped directly to their person and then they can send a separate little box of surprises if they didn’t spend $20. (If you do this, take advantage of the “gift card” section in a order to let them know that’s what you are doing). The first exchange I coordinated started as 30 women putting together a package and has now grown to a couple hundred. And I have a feeling now that we are opening this up to more of the social media world, it’s just going to grow bigger and bigger! Yeah support team!!!! What happens if I send a package but never get one back? Can I share this on my blog/with my instagram followers/on facebook/twitter/etc? What are the dates I need to know in order to participate? You will need to sign up no later than Monday, October 13th. That’s a FULL 2 weeks of time to sign up, spread the message and start brainstorming. You will then receive your exchange partner from me via email on either October 16 or 17. (Because of the hours it takes to coordinate, I am not always able to get ALL the emails out on the same day. So if you see someone post that they got their person and you have not yet heard from me, it’s likely due to the amount of time it’s taking me to email everyone back individually. Do not panic!) Once you receive your person, you will have until Friday, October 31st to put together your package and mail it out. Please make sure if you sign up that you are able to get your box out on time. What happens when I get my package? This is the fun part! I LOVE seeing all of the posts where people show off their package! Post your mug to social media and tag it with #ttcmugexchange2014 so we can all peruse the pictures. Send a shout out to your person, blog about it, tweet about it, do whatever you want to celebrate this fun exchange! I do understand too that there are many women who are not publicly sharing their infertility journey with others so know that you don’t have to share it publicly in order to participate. The key thing is that we offer encouragement and support to one another, even if that circle stays small. Enough FAQ’s! HOW DO I SIGN UP!!?! Alright, here is how you sign up! Your full mailing address (please remember to include your zip code so I don’t have to google! Also if you are in the USA, please type your address on one line (ie: 123 Notebook Lane, Janesville, LA 45698. This makes it a lot easier for me with the system I use). If you are from outside the USA, you can use multiple lines. I will close the exchange at midnight on the 13th (central time) and will not be able to accept stragglers after that. 2. Wait to hear back from me! I WILL CONFIRM THAT I HAVE RECEIVED YOUR SIGN-UP EMAIL. If you do not hear from me within 24 hours, please check the email address you send it to and resend. (Also, check your spam filter to make sure my reply didn’t go there). If you have emailed and still haven’t heard back from me, leave a comment below with your email and I will connect with you. 3. Share! Let your friends know about the exchange! You can share my blog or instagram account so that they can find out more information. I feel awful when someone finds out “too late” and can’t participate so help me make sure no one gets left out. 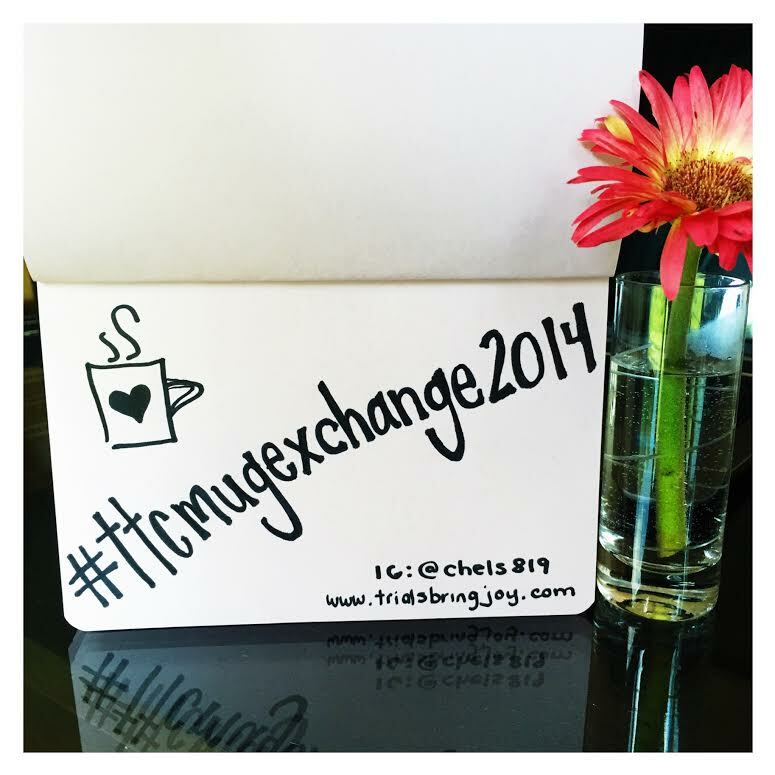 Again, use #ttcmugexchange2014 to share – the more the merrier! 4. Shop, write, smile and sip! Once assignments go out, shop and send out your package with an encouraging note. Then wait patiently and enjoy your mug once it arrives. Share the thoughtfulness of your new friend! I have seen so many amazing friendships form as a result of this exchange. Cell numbers are swapped, emails are exchanged – I have even seen friends plan trips to visit one another due to the friendship formed over a simple package! I LOVE THIS PART! That’s it guys! I am so excited for this. These exchanges are among the highlight of my year and I am pumped to open this up outside of Instagram. YIPPEE!!!! friday favorites – september 26.
friday favorites – october 3. I love this! Sending you my info now! Oh my gosh! In so excited! I’m not always the most active blogger but I read all the time!! I’ll be sending my info in soon! So excited to have you joining us!!! It’s gonna be a blast!!! Yay! Whoo! Can’t wait to participate again! These exchanges are always so fun! Yippee!!! This one is generating so much excitement! I cannot wait! I’m sending my info in as soon as this is reposted…… Hope you all will too! So super excited to have you joining us!!!!! Hurray! I have already signed up! I hope some of you lovely ladies do too- we all need a little sunshine in our lives. Plus, who doesn’t love coffee mugs?! I know not many people are following me yet but I figure why not share such a great fun thin! So excited that you are participating and that you helped spread the word so no one misses out on the fun! OO, I am so excited. If you would like to join the TTC Mug Exchange please send an email to ttcexchange@gmail.com no later than 10/13/14. I’m in! Such a fun idea! This sounds like a pretty fun event/exchange taking place, and I’m looking forward to participating! I’ve (virtually) met so many inspiring, brilliant, strong women through this blog and I am truly grateful to have you out there for support and often a lot of comic relief (sometimes I don’t know which is more important). I love you all! Just signed up! SO excited! What a blessing you are Chelsea, in the TTC community! You’re so sweet! I’m so excited!!! I want to learn more about this! I love this, I am all signed up! Also excited to have found your blog through Jessah! Yay! So excited you got to spread the word so more people can join in! Thanks Amie!!! Eekk. I am so excited for this. I have been stalking instagram for photos of everyone’s packages. This couldn’t have come at a better time. I have been feeling so down in the dumps. But putting together a package for a fellow TTCer has really made my last few weeks. Thank you for doing this. I am so glad that thiS was a positive distraction and came at a good time! I too have loved seeing all of the packages come in. SO MUCH FUN! Praying for you and hoping that this day and weekend is a great one for you! XO!